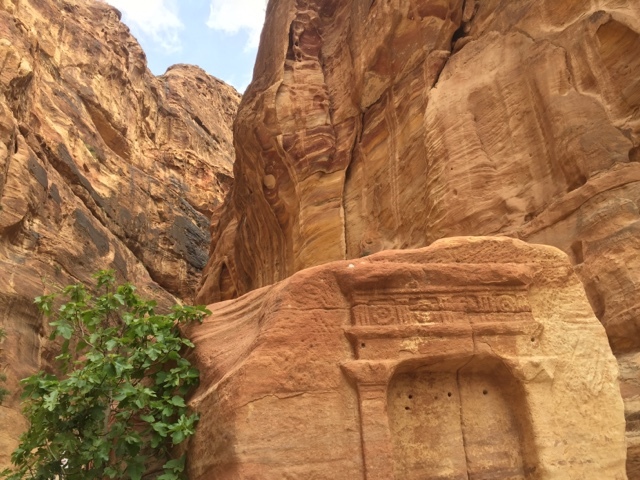 "Starting from here, we will be walking along Al-Siq to Treasury for about 1 hour", Auni, our guide, sweetly announced our first itinerary in Petra, Jordan, in his tick Arabic accent. "We will be experiencing the Indiana Jones, the Mummy, or even the Transformers here", he added with smile. That morning, Sunday, March 21, or feels like Monday for locals, I have packed my stuff. From water bottles to mist spray, from bengay cream to extra batteries for my camera. 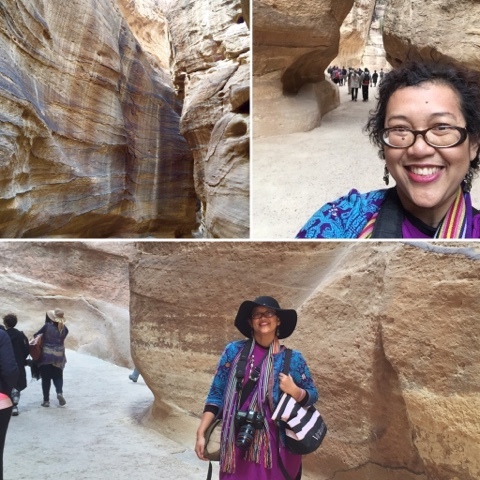 Yes, I was so excited to come and visit Petra, the Lost City, or the Rose Rock city, the treasure of Jordan. As I start my bucket lists riveting around the world's wonder and UNESCO World Heritage, visiting Petra is my dream-comes-true. Back in 2010, Bo, Rudi and I had an amazing 9-day visit to Egypt, exploring the historical Cairo, Alexandria, Luxor, and Aswan. I was 6.5-month pregnant at that time and we initially planned to visit Abu Simbel and Petra. 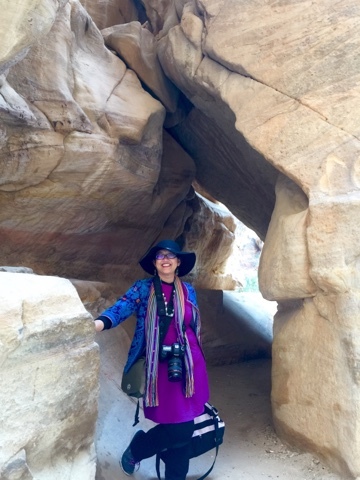 But despite the fact I walked miles and miles visiting tombs, museums and all those jaw-dropping nature and palaces with heart-breaking ancient histories filled with love, lust and power, My hubby and I finally decided not to force ourselves to Abu Simbel and Petra. And there I prayed that one day I will soon be back to these remarkable places. And my prayer is answered in 2016. Alhamdulillaaah. Merci ya Rabb. 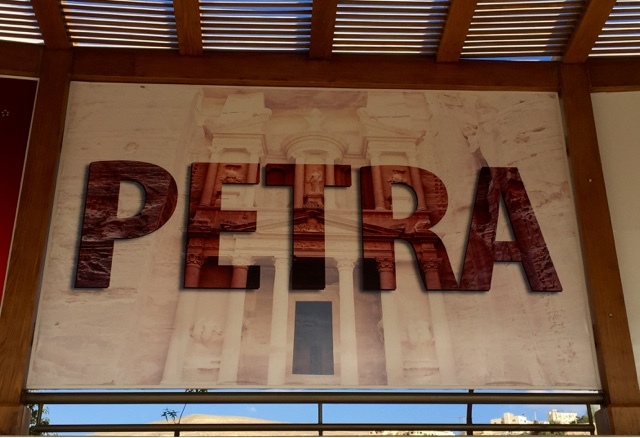 So, as we wrapped up our Global Commission on Internet Governance in Amman, Jordan, I nearly couldn't sleep the night before our trip to Petra. Packed all the essentials and a determined heart, I got all my gears ready. IPhone - checked, 5D - checked, 24-70 mm lens - checked, memory card and extra batteries plus power banks - checked. I just don't wanna miss this moment. 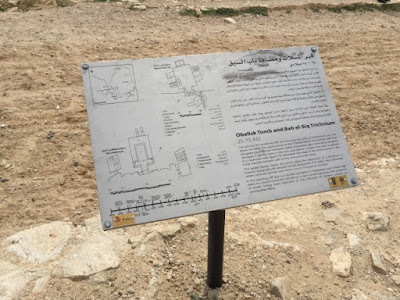 So, 7.15 AM we left Four Season Hotel in Amman and headed to Wadi Musa. 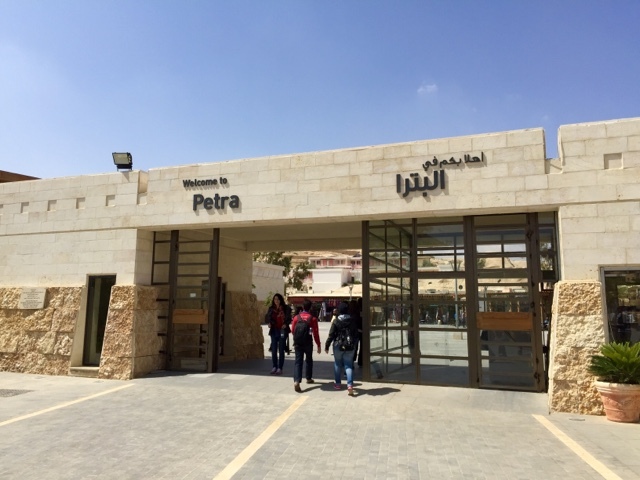 It took 3.5 hours drive from Amman to Petra. 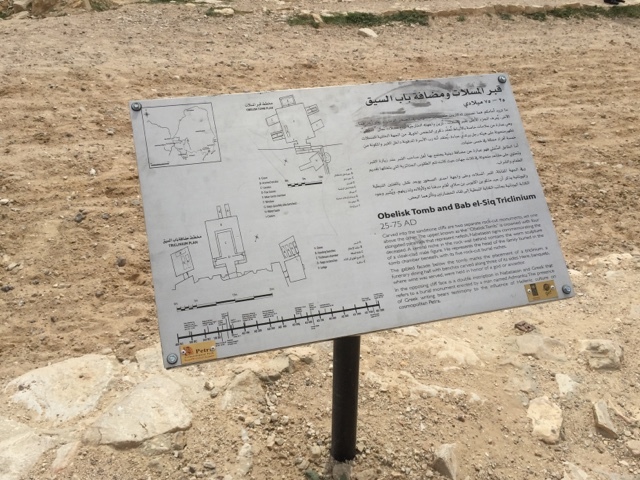 While approaching Wadi Musa, we stopped at Musa Spring, ot the spring of Moses. 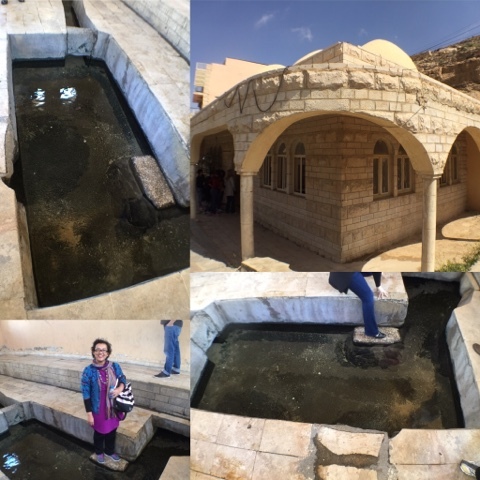 After a quick stop here at the spring of Moses, we finally arrived at our destination. So first, you gotta get your ticket. 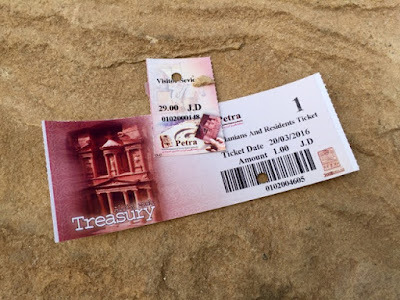 It costs 1 Jordan Dinar for locals and 29 Jordan Dinar for foreigners. They have 2-day and 3-day tickets as well which will of course cost more. We only got the 1-day ticket because we flew back home the next day. 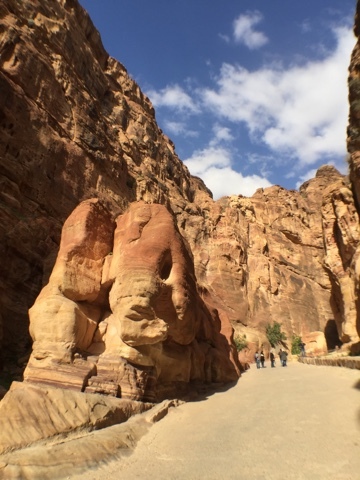 From the ticket gate, we have to walk for about 10 minutes to Al-Siq, the wonderful alley made of curving stones which hide Petra from the outside world. Even here, the clear blue sky already mesmerized me. There are a few people offering us to ride the horses. They said it was a free ride and it was included in our ticket. But then, as I read in the web, it was tricky they would then as you some tips and you could end up paying $20. 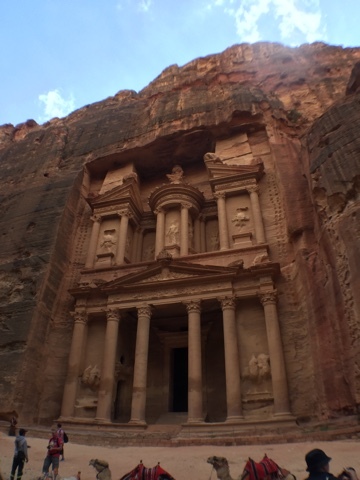 So then, I decided to walk to Al-Siq. And it proved to be close enough. 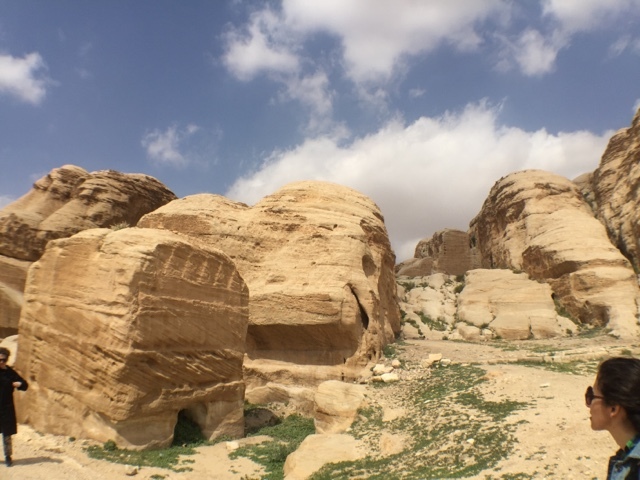 one of the rock formations..
On the way to Al-Siq, you would see incredible rock formations. 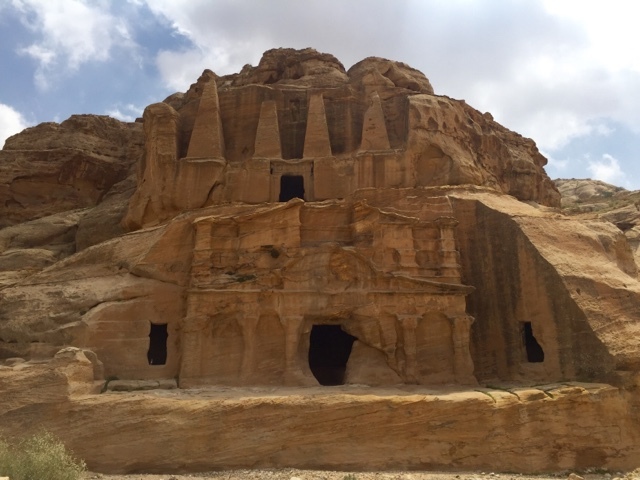 Including some old tombs. Clear blue sky is indeed the perfect background for this. We even have the Djin or the Genie rocks ;). 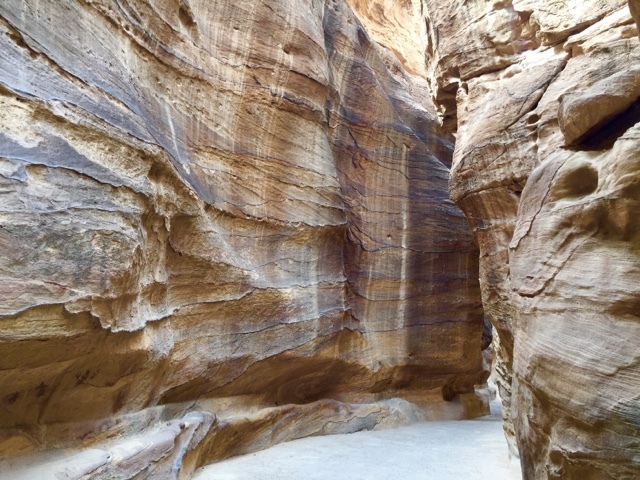 And walking along Al-Siq itself is quite an experience. Those natural sandstones are incredible. Windong along to the Treasury, the Siq is about 2 km walk. It could take up to 40 minutes or more, depending on your speed and whether or not you're stopping for photos here and there. Like I did. You can of course take the horses, donkey or the cart. I chose walking because I wanted to take pictures as much as I can. Look at these photos and you will see why :). The elephant rock...it does look like one.. Already such an amazing journey heading to the Treasury. And of course, the monastery. A long list of places to see for sure. And I only got around 3 hours to walk around this huge historical complex. Not to mention donkey, camel, mule or horse rides :). 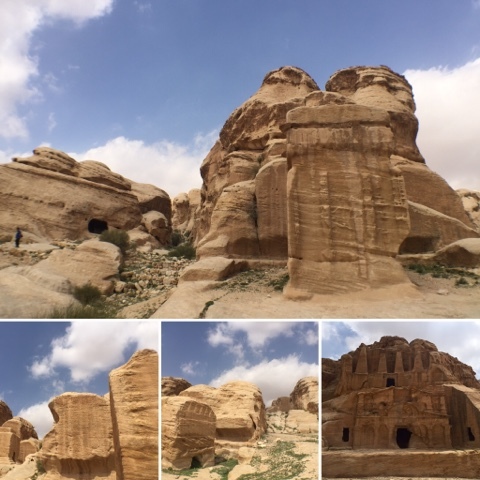 For sure, tons of photos are the proof of my visit to this incredible site. I guess I gotta go back for more stories and photos. It looks like you had a wonderful time. Your photos are beautiful. It was indeed a blast, Cascia.. It was an amazing one..
good to go back there again .. I wish I can go there someday. 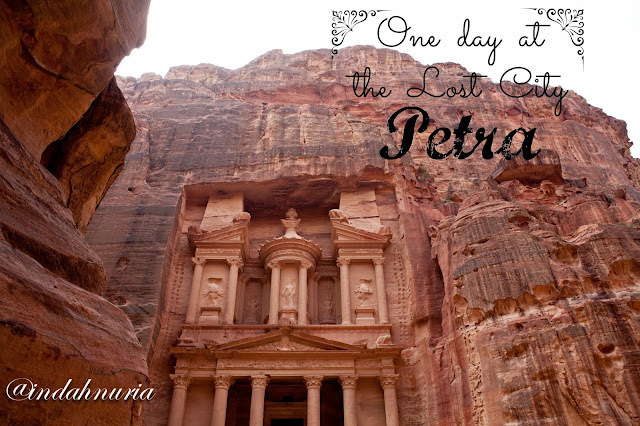 Petra is the next destination after Mekah and Madinah. Pernah liat destinasi ini di Nat Geo. Mereka bahas ttg cara membangunnya. Kagum! 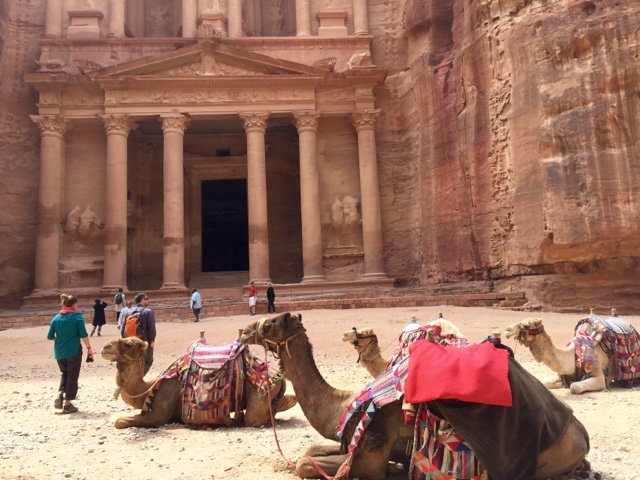 I would love to travel to Egypt and Petra too, that's one of the trips we want to make as soon as the girls are older... lot of history in all those stones. Thanks for all the info, Indah! Tiap2 baca ttg Petra, nggak habis pikir bisa dibangun seperti itu. Amazing. Sama mba Lus.. Kebayang luar biasa itu bangunnya..
What an amazing experience! It is absolutely beautiful! Thanks for sharing with #OMHGWW!